If you listen to the TEAM 1040, amidst the whining about NHL officiating and the constant broken ankles from Canuck bandwagon jumpers, B-Mac extols the virtues of "Flame-Grilled Chicken Time" brought to you by Nando's. Yup, that's the chain of restaurants that offer up spicy (if you choose to) flamed grilled chicken. Hey, as much as it is expensive, I do have the occasional craving for Peri-Peri sauce. However, did you know that there is a similar place out there that hails from South Africa? 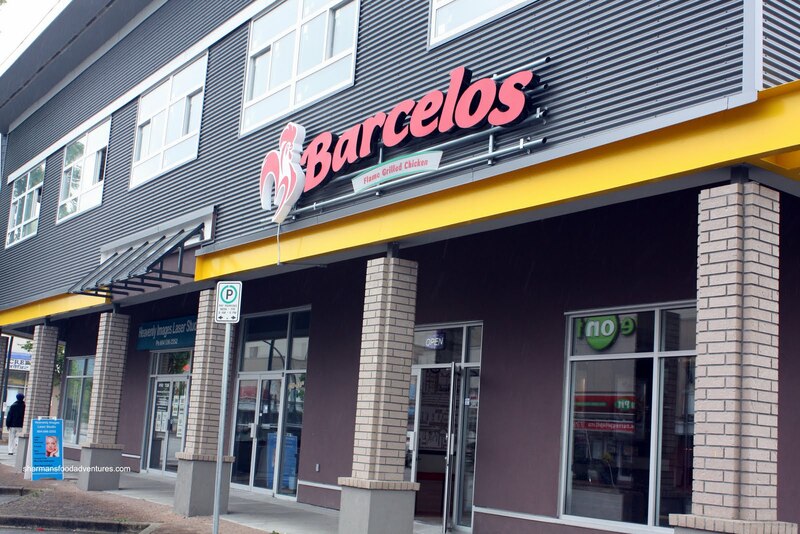 Barcelo's is the name and flame-grilled chicken is its game. 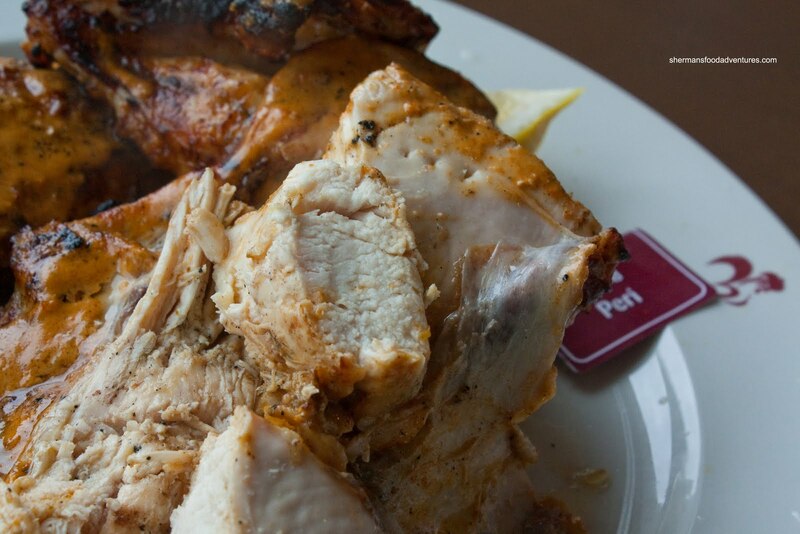 With its first ever location in Canada, it seems to be moving in on Nando's flame-grilled chicken monopoly. 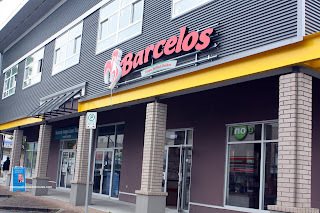 Down to the ordering at the counter, choosing your sides and how hot you want your chicken, Barcelo's is very much like Nando's except with the addition of beef burgers. But wait a sec. There is one more significant difference. Try lower prices. I decided to go for the Half-Chicken meal with 2 sides. At $12.50, it is a full $2.00 less than Nando's. That is roughly the savings you'll see across the board here. I went all out and had it Supa Peri, which is their equivalent of Extra Hot Peri-Peri at Nando's. Since they flame grill their chicken to order, I had to wait approximately 15 minutes. No matter though, I much prefer freshly made food than something that has been sitting around. When it did arrive, it was a substantial amount of food. It wasn't a small half-chicken. Nicely charred on the outside without being burnt and smothered with hot peri sauce, there was also no absence of flavour either. I dug in and the meat was very moist including the breast. Smoky, spicy and zesty, this could give Nando's a run for their money. In fact, I really liked it. Considering that it was cheaper, this would have a leg up on Nando's (sorry for the pun). 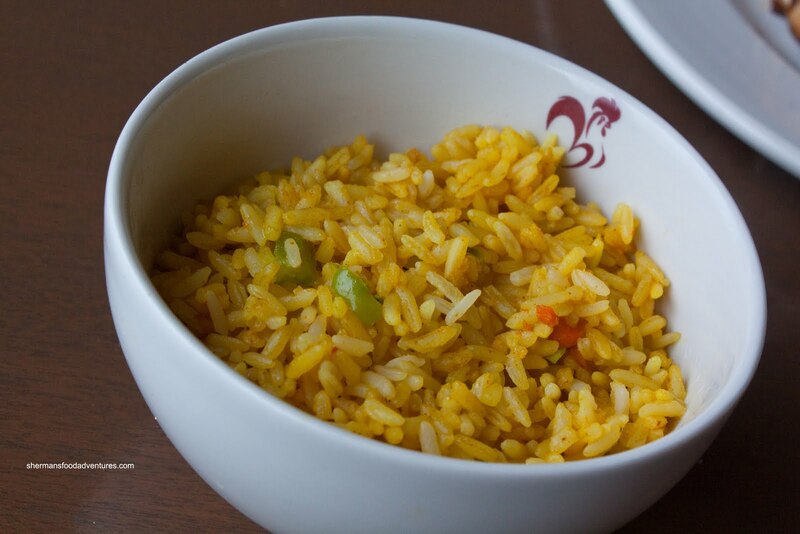 The first of my 2 sides was the Spicy Rice. I'm not sure if it was really all that spicy. But with my tongue tingling from the Supa Peri sauce, nothing would be spicy in comparison. 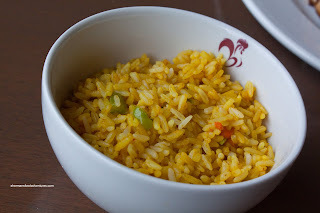 I did like how it was served piping hot and the rice was the perfect texture (chewy and completely separate grains). For my second side, I opted for the ol' standby being the Fries. Although the fries were nothing to get excited about (being generic fries), they were cooked up perfectly. They were golden brown and very crispy. 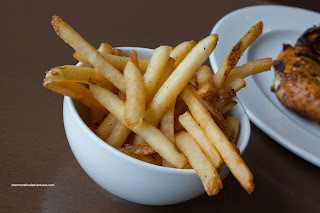 Inside each fry, there was still an appreciable amount of potato as well. All-in-all, a very solid first experience at Barcelo's. I would definitely say that considering the prices, it ranks above Nando's. I think the food quality is roughly the same and in fact, it was probably better on this visit. My biggest complaint with Nando's has been their pricing and Barcelo's seems to have alleviated that problem. I'm curious to see how well this location does and if any more will open. If one opens up close to me, I would probably pick up their family dinner pack quite often. 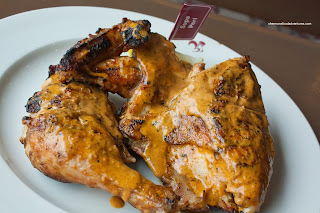 barcelos was created long before nando's, rumor has it the two jewish guys who started nando's took this idea in johannesburg. @chefbeee Thanks for the info!